Reggie White (#92), Jerome Brown (#99) and Mike Pitts (#74) were part of the dominating defense of the Eagles during the late 1980s. A new NFL Network special looks back at a time 20 years ago when the Philadelphia Eagles also had a team that many believed had the talent to win a Super Bowl. 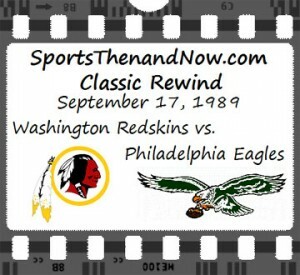 However, while three of their division rivals were able to win titles in the early 1990s, the Eagles were left to contemplate what could have been. The documentary focuses on two of the defensive stars from the Eagles teams of the late 1980s and early 1990s, Jerome Brown and Reggie White. Both players were key components of one of the dominant defenses of the era and both players passed away far too early (as did fellow Eagles from that era Todd Bell and Andre Waters). Between 1988 and 1992, the Eagles posted a 52-28 regular season record and joined the San Francisco 49ers as the only teams in the NFL to post double digit victory totals in all five seasons. However, while the 49ers claimed two Super Bowl titles during that stretch and the other three were won by the Eagles’ NFC East rivals the Giants, Redskins and Cowboys, the Eagles were left waiting for a next year that never came. Under the guidance of head coach Buddy Ryan, defense was the calling card of the Eagles during that era. Utilizing the 4-6 defense that had helped the Chicago Bears win a Super Bowl, Ryan turned the Eagles into an intimidating, ball-hawking defense that regularly created big plays on the defensive end of the game. 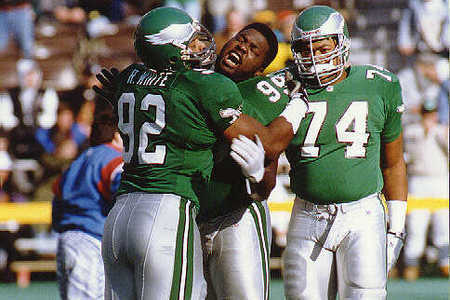 While the unit had many talented players, the unquestioned leader of the defense was defensive end Reggie White. 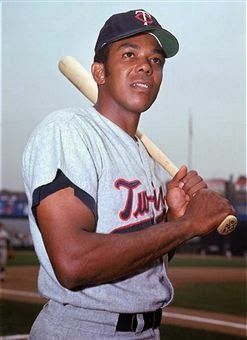 The “Minister of Defense” was a defensive juggernaut and regularly punished any quarterback or running back that dared get in his way. During his eight seasons with the Eagles between 1985 and 1992, White registered 124 sacks in 121 games, including an amazing 21 sacks in just 12 games during the strike-shortened 1987 campaign. He also forced 18 fumbles and recovered 12. When Philadelphia made defensive tackle Jerome Brown their first pick (ninth overall) in the 1987 draft, it provided White with a rush partner that forced opposing offenses to worry about the rush from both the inside and outside. 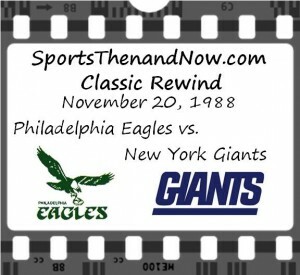 The Philadelphia Eagles and the New York Giants renewed their bitter rivalry in a pivotal game for the NFC East title in week 12 of the 1988 NFL season. The Giants entered the game with a 7-4 record and tied for first place in the division, thanks to quarterback Phil Simms and their stellar defense, lead by All-Pro linebacker Lawrence Taylor. Meanwhile, the Eagles entered the game one back of the Giants, with a 6-5 record. 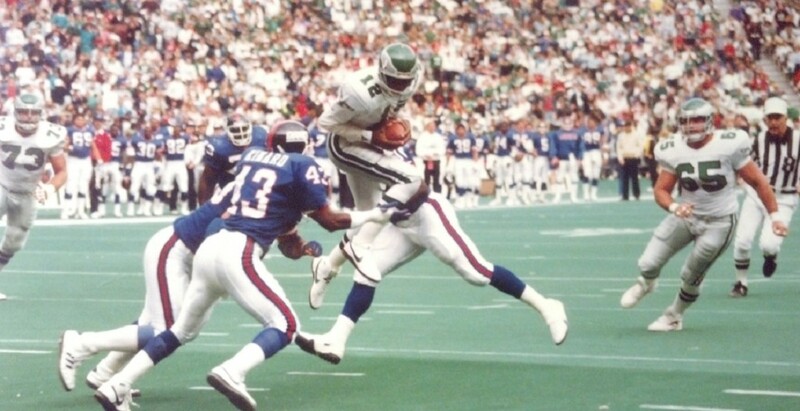 Like the Giants, the Eagles had a great defense; the “Gang Green” defense constructed by head coach Buddy Ryan and featured a lineup that included defensive tackle Jerome Brown, linebacker Seth Joyner, rookie cornerback Eric Allen, and sack master Reggie White at defensive end. But the biggest star on the Eagles was quarterback Randall Cunningham, perhaps the most exciting player thanks to his rocket arm and scrambling ability. 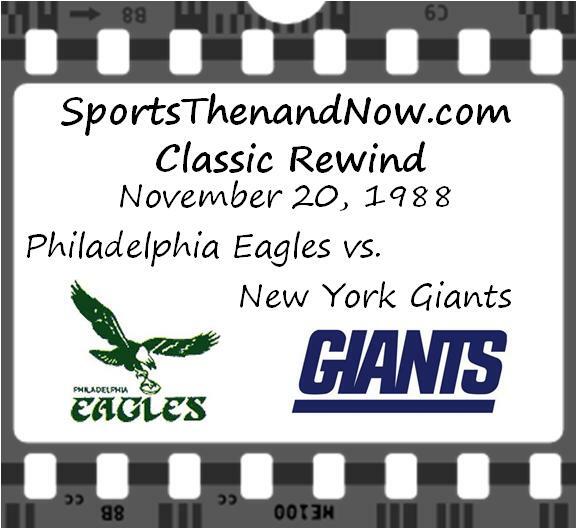 The Eagles met the Giants earlier in the 1988 season on a Monday night in Philadelphia when Cunningham pulled off a play for the ages.